Skin allergies in horses is becoming more common and there are a number of treatment options available to veterinarians and horse owners. An allergy is caused by an over-reactive immune system, where the normal body defences that fight pathogens (bacteria, viruses, parasites) start targeting “normal” particles from the environment that have contact with the skin surface. Such particles are called “allergens” and may include airborne particles (such as mould spores, pollens, and dust/storage mites), contact particles (e.g. leather, plants, and topical products), food items, or injected particles (e.g. from insect bites). Allergies require initial exposure to an allergen (may vary from weeks to years) before “sensitisation” occurs, and thereafter repeat exposure will result in the allergy response. A combination of immune cells and particles (antibodies, cytokines, T-cells) then react, and produce the allergy symptoms. Equine allergies, which primarily affect the skin and respiratory tract, are becoming increasingly common. They can be performance-limiting, irritating or painful, unsightly, and time-consuming to diagnose and treat. Not only is the allergy itself problematic, but secondary problems such as self-trauma (e.g., tail rubbing due to extreme itchiness (pruritus) (Fig 1) or secondary bacterial infections may also require treatment. Horses can develop allergies at any age and, once affected, remain allergic to those substances for the rest of their lives. Allergic reactions can vary widely in their severity, ranging from mild small regional reactions to life-threatening anaphylactic reactions. Common manifestations of skin allergy include urticaria (hives), (Fig 2), pruritus (itching), rubbing, scratching, thickened skin and hair loss. Respiratory allergy often manifests as coughing, exercise intolerance, and poor performance. Allergic airway disease is also referred to as heaves, recurrent airway obstruction (RAO), and inflammatory airway disease (IAD). Accurate diagnosis relies on a thorough physical examination and clinical history, some simple skin surface tests in most cases (skin scrapings, cytology tests, hair examination), and insect-treatment or avoidance trials. Sometimes biopsy can be helpful to exclude other non-allergic diseases (e.g. mites, fungal infection, rain scald, pemphigus), but will not distinguish between different allergies. 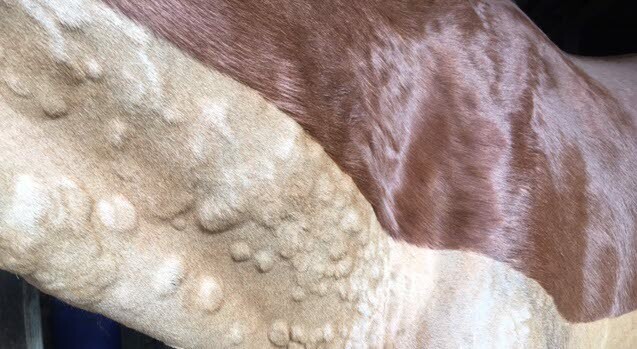 If airborne allergies are suspected, Intradermal (“skin”) allergy testing (IDT) and serum allergy testing (SAT) can be used in horses to identify the causal allergens (they won’t help at all with detecting contact or food allergens, and will only sometimes help with insect bite allergies). The IDT involves injecting small amounts of allergen extracts into the skin, and looking for a hive-type reaction at each site in the next 15-30 minutes. The use of corticosteroids, antihistamines and phenothiazines (such as acepromazine) within two to four weeks before testing may interfere with test results. Serum allergy testing involves the analysis of blood for IgE antibodies to specific allergens (e.g. individual pollens, storage mites) and is less affected by corticosteroids or antihistamines, however 2-week minimum withdrawal is also currently recommended. Results of both tests require careful interpretation, best done by a specialist dermatologist. The treatment of equine allergies may require a multifaceted approach and in many cases prevention may prove to be the most valuable tool in keeping allergies under control. Horses with known allergies should be managed accordingly. For example, horses that are known to be hypersensitive to Culicoides (sweet or Queensland itch) should be stabled during peak insect activity (early morning and evening) whenever possible, rugged and hooded as needed, and insect repellents used additionally as needed. Symptomatic treatments to control the itch in the short-term may be needed, and may include topical cortisone, soothing shampoos and conditioners, fatty acids, and oral (Prednisolone) or injectable (dexamethasone) forms of cortisone. Prednisolone is less potent and probably less likely to result in laminitis and therefore is preferable to other corticosteroids such as dexamethasone or triamcinolone. Allergen-specific immunotherapy (ASIT) or hyposensitisation is another therapy that may be considered for airborne allergies (that may present as itchy dermatitis, urticaria and/or respiratory disease). Allergens are combined in solution and injected under the skin in gradually increasing concentrations aiming to stop the allergy reaction. If effective, treatment may need to be life-long, however injections can be gradually reduced after 2 years if there is good control, and some horses can stop therapy. Response to therapy is not immediate and can take up to 12 months to determine efficacy. For horses with respiratory allergies, controlling environmental factors is also important for successfully managing the disease. Owners should consider the horse’s “breathing zone” – the two-foot sphere around his nose. This zone should be kept as clear of dust and particles as practically possible in order to help reduce airway inflammation and dilate the airways. Feeding from the ground and keeping horses outdoors are also important management factors in the process. Acute episodes may be treated with corticosteroids such as prednisolone and fluticasone and/or bronchodilators if necessary. Successful treatment of equine allergies necessitates a thorough examination of the individual’s environmental influences along with a multimodal approach to controlling the causative factor once a diagnosis is reached.